Glisten Plus capsules are powerful ayurvedic blood purifier pills that help in cleansing blood naturally, improve health and vitality, and make skin glow and look radiant. Blood carries oxygen and nutrition to all parts of body. By gaining nutrition and oxygen cells of body perform their activities and reproduce to build tissues and strengthen organs. But along with nutrition digestive system may also have toxins which accompany food and drinks, blood absorbs nutrition from digestive system and distribute, in the processthese toxins also get supplied to cells if lymphatic system and liver are not working well to keep blood purified. Toxicity can damage organs, cells and tissues of body and make it weak and prone to sickness. Glisten Plus capsules are Ayurvedic blood purifier pills which improve body’s cleansing system to keep blood purified. 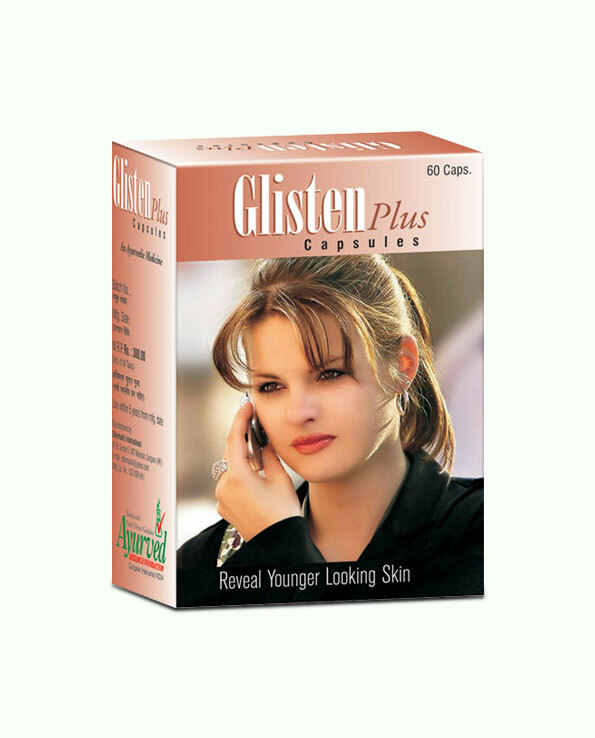 Glisten Plus capsules affect the problem in two ways, these ayurvedic blood purifier pills, lower toxicity and also promote blood cleansing to protect and improve health.These ayurvedic blood purifier pills are also great for shiny, tight and soft skin as these prevent issues like acne, and keep skin healthy and nourished by keeping blood free of toxins. Glisten Plus capsules supplement anti-toxin compounds which nullify these harmful agents and also powerful antioxidants which delay tissue ageing and protect cells from damage inflicted by free-radicals. Ayurvedic blood purifier pills improve kidney and liver functions which filter impurities and remove harmful chemicals and toxins from blood. These pills enhance body’s lymphatic system which removes toxins, chemicals and other damaging agents from blood. With stronger liver and kidneys and powerful lymphatic system body gains purified blood which supplies only nutrition and no toxins. Some of the herbs used in this ayurvedic blood purifier pills regulate smooth and complete removal of waste matter which curb presence of toxins and keep digestive system clean. Gilsten Plus capsules also enhance immune system functions which also act against impurities present in body and blood, and nullify and remove them out of the system. All these benefits make this holistic ayurvedic blood purifier pills extremely beneficial for sound health, higher energy and strength. The effects of this ayurvedic blood purifier pills improve skin’s health, sheen and texture by keeping it healthy and nourished. Glisten Plus capsules possess herbs which promote smooth and quick digestion; slow digestion also allowsbuild-up of toxins and harmful chemicals which get transported to organs through blood. Glisten Plus capsules cleanse blood naturally and also promote secretion of bile to enable quick breakdown of complex food items like protein and fats to prevent toxicity and improve energy. These herbal detox pills cleanse blood naturally and help in preventing numerous disorders and diseases. These herbal detox pills are effective anti-ageing and keep a person in sound health, high on energy and have younger looking skin for longer period in life. Glisten Plus capsules are 100% safe supplements for men and women of all ages. These can be taken regularly to prevent disorders and diseases and stay on top of health. These pills improve looks and energy levels and also keep immunity higher to keep a person free from health problems. Due to powerful blood cleansing properties these are excellent natural aids for gaining smooth, glowing and tighter skin and charming looks from inside. Glisten Plus capsules possess amazing herbs like – Ksheerika, Murva, Chalmeri, Manjishtha, Kasumba, Guduchi, Pitpada, Amarbel, Amla, Karanj, Ananatmul and Chobchini. These herbs improve liver, kidney and functions of lymphatic system to purify blood and lower toxicity and increase disease fighting abilities of body. Anyone can use these pills even if one has busy daily routine. Consume one or two pills after breakfast and dinner with water or milk regularly to gain healthier and energized body and younger looks. Herbs cannot show overnight results, these take some time to overcome weaknesses and treat disorders, one need to be patient and regular while using these pills. We recommend 4 months duration for those who face moderate symptoms and 6 months use for men and women with severe symptoms. Eat fresh and nutritious and avoid greasy, oily, fatty and preserved foods. Avoid alcohol, beverages, caffeine and caffeinated drinks. Remain active and perform regular exercises and drink plenty of water. We accept payments through Cheque, DD, cash deposit in account and NEFT. We also offer COD for delivering products in India. We value your privacy and maintain confidentiality always. Products will be hand-delivered right at your doorstep packed in a plain envelope containing your name and address only. Our products reach you within 3 to 5 working days within India through FedEx. Can you believe, pimples gone in 15 days. There are many products against pimples and acne, but this one worked as promised. Must buy for everyone having pimples!! My daughter had acne since she was 18. I had read about Glisten Plus in online reviews and decided to have her try it. It hasn’t been very long time, but it seems to be helping. I have been taking these supplements for two weeks and I can see my skin looking more radiant and fair. Results are fantastic and worth mentioning. Amazing BLOOD DETOXIFIER PRODUCT!! It improves skin glow and fairness beyond imagination. I can’t believe this has been the only product that has cleared up my acne marks. Really effective and safe!! Very happy with this! Quick delivery, quality product. It purifies my blood which has a good impact on my skin, and my pimples are gone. My skin looks clear and clean. I love this supplement.